Planet Labs is an American Earth imaging company which designs and manufactures Triple-CubeSat miniature satellites called Doves that are then delivered into orbit as passengers on other missions. 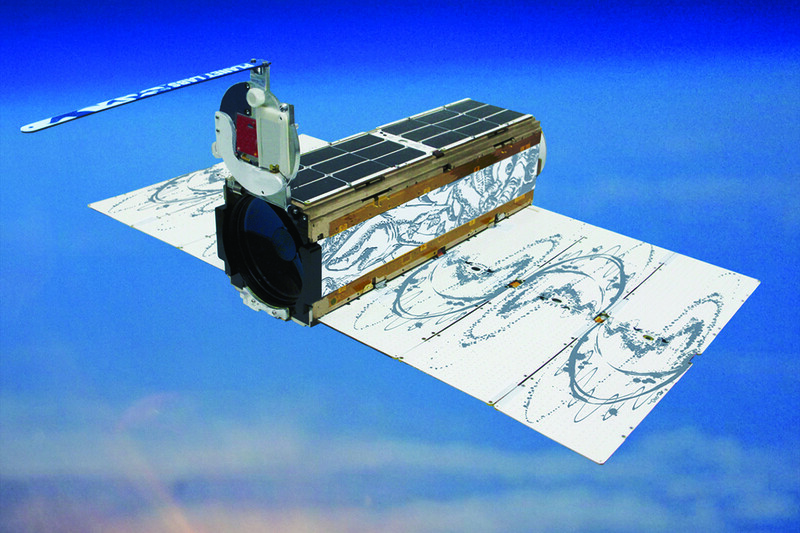 Planet Labs uniqueness comes not only with their products but also with their creative spirit which the fuel with a unique Artist-in-Residence program. We had the change to interview Forest Stearns the Curator of the artistic experience at Planet Labs, Director of the Artist-in-Residence program, In house illustrator for all things space art. and the Visual director of the brand experience. We want to take the opportunity and thanks Forest for sharing with us their vision and activities at the AIR in Planet Lab. Planet Labs claims that “Creativity is required in both science and art. We rely on creative thinkers from all disciplinesto solve complex problems in space, in software and in the office. ” and with that, let’s jump directly to the interview with Forest. TheArtian: What is the AIR all about? Forest Stearns: Our AiR is intended to inspire creative permission in the entire Planet Labs team. As well as introduce artists to the very unique commercial ecosystem of Earth Imagery and Aerospace. I always state the the program is Awesome, Unique, and Uncomfortable. We are bringing in our 10th AiR this month. 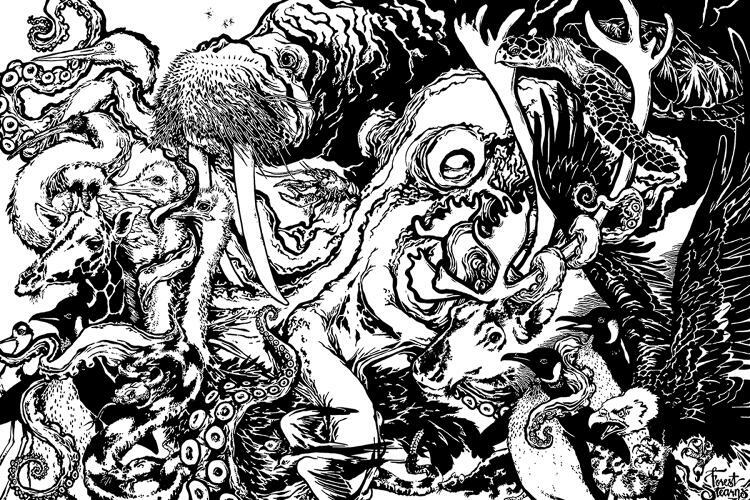 We try to diversify the styles and mediums of the artists that join us so it stays exciting. The working space is tight so the the mediums of the artists are limited to what can be made in an office environment. 2D artists have had the greatest success. Our structure is pretty hands off. The artist is prompted to get involved in the different levels of conversations in the lab. Different artists will resonate and inspire different teams. I try to help these connections happen, but I don’t micromanage it. TA: Why did Planet Labs start this program? FS: The AiR program started with a bold question that I asked Founder Robbie Schingler while at a Venture Capital funded unconference campout. After I sat in on his hour long talk about the future of the space industry and humans migration to new planets I boldly suggested. “Let’s paint on your satellites!” He was all for the idea when I asked permission and one up’d the offer by stating that he saw the value in instilling an AiR but needed guidance doing it. I offered to be the first artist and to create the program. It sprung out of that quick interaction of two very passionate people who value the power of creativity and humanitarianism. This conversation happened in the fledgling stages of Planet, when there was only 2 satellites in orbit. We have now launched around 150 satellites all covered in the my art and pieces made by AiR and our community. 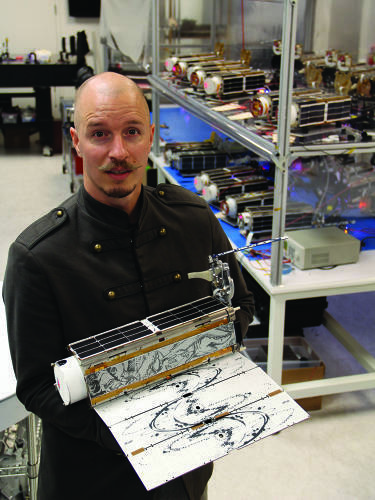 In collaboration with Planet Labs, the Autodesk Pier 9 Workshop released Art in Space, an exhibition of art laser etched on satellite panels and launched into outer space. Art in Space from Pier 9 on Vimeo. TA: What is the artist’s contribution in your opinion to the company? It is a way for our employees to have pride in our company outside of the regular nuts and bolts. Being part of the art that is created daily gives ownership to the cultural experience. Being surrounded by ever changing art is inspiring to the employees and is an obvious differentiator to applicants looking for a unique tech company experience. We make hardware and software, and through the arts we all feel connected to it. It is very powerful in a really simple and honest way. The AiR program is a subject of pride for the executive teams and the investors. People want to have that connection to the company that their soul is invested in. Creativity is a human experience that is easily celebrated and valued if presented well. The audience of our brand really appreciates the Art that is incorporated in our product and outputted from our AiR. Having beautiful illustrations on our satellites, in our workplace and in our radomes makes the technology more approachable and understandable. It is a beautiful jumping off point to describe the mission driven nature of the company. TA: How do you create a common ground for the artist and the company’s employees? FS: I do my best to articulate what the AiRs are up to during their sessions. Simple internal blog posts and email updates are crucial. We also have art nights where the the artists and I get employees together to have creative sessions in the evenings. Sometimes teaching specific art lessons, and other times it is more free creativity exploration. TA: How do the employees and managers respond to the program? How they engage, if at all? FS: Some employees really adopt the AiRs while others don’t even notice. It is easy to appreciate from afar, or to get involved on a day to day in the progress and creative process. TA: Can you share with us an example for a successful collaboration/s between the artists and the company’s employees? FS: Some of the artists have made art to be engraved into the satellites, some artists get really involved in illustrating company historical events or celebrating the scientific history of our interests. Some artists have teamed up with different teams to make art from the raw earth imagery while others have made technical pieces or pieces in total jest of the technology. TA: What is the company’s benefits from these successful collaborations? Can they translate it to an innovative product/service? FS: The company gets to witness large pieces of art in a common theme to their work being made on a regular basis. This seems simple. It is, but the benefits are profound. When a very analytical person takes the time to watch an artist make a piece from the seemingly creative eather and talk to them about the process, that analytical employee will be inspired by the abstractness and go back to their own workstation and look at their own solutions in a more well rounded manner. Creativity is set aflame when you witness someone solve curious problems and take impossible chances to produce a beautiful and inspiring endpiece. As an artist here, I may not inspire the science behind the technology but I do inspire the permission to look at the problems and collective ecosystem from a different perspective. TA: How does the company define success in this project? What is the desired outcome? FS: Simple success is word of mouth and eager storytelling press. A more depthful success is believing that human creativity rests in both sides of the brain and having the super artistic and the super analytical thought processes sided by side inspires new solutions while inspiring a more well rounded human experience. Thanks Forest! Check Planet Labs Website HERE.